We are in the Indian Ocean 11 degrees North, 59 degrees East. After three weeks at sea, we are getting a glimpse of the lives of the sailors. The captain, puffing on his electronic cigarette, is very much in charge and nothing happens without his knowledge and approval. The crew on the bridge work on a four hour rotating shift system, the others 8:00 -17:00 working day, except when in ports. They all do work disciplined and keep the ship clean and tidy. There is always someone painting, washing down the decks, checking the lashing of the containers, repairing the odd thing here and there. Being on contracts, they chose how long they will be away from home, mostly for 4 – 9 months, always on different ships. Crew members leave and join the ship randomly and they call each other by rank, not name. Many sailors behave somewhat introvert, they do not seem to need other people. They are not talkative but respond to questions in a friendly but indifferent way. They tend to avoid talking to Francien as they are not used to women on board, but are very polite and respectful. The officers are from Croatia, with the exception of the Chief Officer (Serbian) and one Second Officer (Montenegro) and speak only Serbia-Croatian to each other. The crew are all Philippino’s speaking Tagalo and English is only spoken when absolutely necessary. This language barrier initially made us feel outsiders, not really included in the day to day activities. The first two weeks it took us a lot of effort to start and maintain conversations before they became more comfortable and open to us. The captain has asked the cook a few times to increase the variety of the food, but the food is still bland tasting and every week the same is served: lamb chops, spaghetti, octopus, mackerel, backed potatoes, swordfish, chicken, stuffed green peppers, fresh fruits and freshly made pastries. ‘Cookie’ (that is what the crew calls the cook) is trying hard, but nevertheless Francien and I are now longing for some nice Malaysian food! The engineer has filled the pool with seawater (29 C) and we enjoy a refreshing dip in this hyper saline water. Every other day the ship's clock is advanced one hour. Many hours we sit on deck on our stretchers gazing at the endless sea, spotting another pod of dolphins frolicking in the white capped broadsiding wake of the ship. Between the Gulf of Aden and the southern tip of India, stretching 2700 miles and six days of sailing, pirate attacks do happen and the shipping company has taken precautions in case the international task force ‘enduring freedom’ does not prevent one from happening. During a security briefing it was explained that in case a pirate skiff would come close, our ship will increase its speed to maximum 23 knots ( we are doing now 18 knots) and will take a zig-zag course, causing currents around the ship which can easily flip over small boats. Red plastic sleeves are hung over the railings on the lower decks to prevent pirate hooks catching on. Firehoses, positioned at spots around the ship with low freeboard, will be fully opened. The general alarm will be sounded and most crew and passengers will move to ‘The Citadel’, which is a safe room inside the ship (I am not allowed to disclose details) with emergency supplies and most importantly a satellite phone connected to the anti-piracy task force headquarters in Dubai. 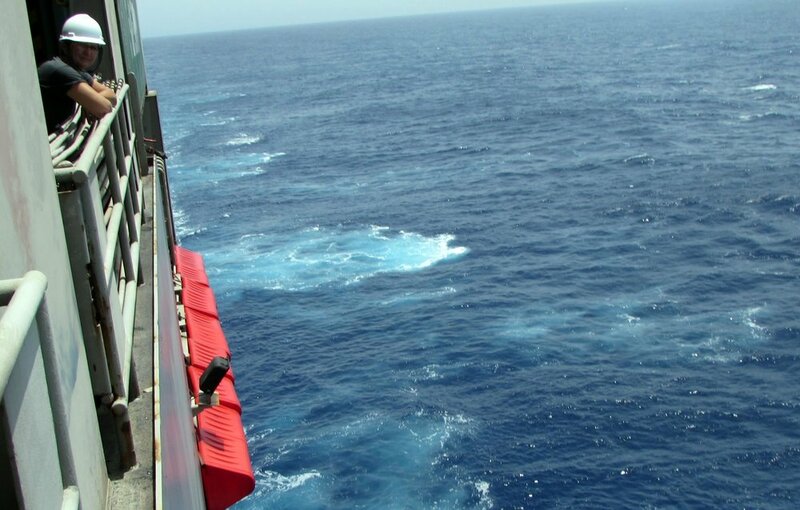 When we passed the eleven miles wide strait of Bab El Mandeb in the morning, entering the Gulf of Aden, we saw the barren coast lines of Yemen and Djibouti. It was oppressively hot and humid, a haze hanging over the calm water. A skiff with seven men standing on it approached us. It looked suspicious, but did not come closer than 500 meters before heading further in northerly direction. They could have been pirates, smugglers or simply fishermen, but we do not know! A few hours later we saw a navy ship on the horizon sailing parallel to us. A helicopter took off and patrolled the skies. It was all quiet exciting for us, but the crew handled this in a calm and reassuring manner. From now on the ship is darkened at night and we have to keep all curtains tightly closed in our cabin. Since the start of our voyage we had blue skies and hardly any wind. We passed the Socotra Islands of the Somali coast on the very tip of the Horn of Africa and start to feel the South West monsoon, bringing clouds, four meter swells and 25 knots winds. What is the raw ocean, but the best protection against pirates?